Swedish furniture retail giant IKEA is creating a new distribution centre in Richmond, B.C. IKEA said the 330,540-square-foot customer distribution centre just south of Vancouver will be its third in Canada, adding to distribution centres in the Toronto and Montreal areas. The new centre is part of the retailer’s bold Canadian expansion plans which will see it double in size over the next eight years, an IKEA spokeswoman said. “In 2015, IKEA Canada announced our ambition to double the number of stores from 12 to 24 by 2025, and expand from coast to coast,” Amanda Fitzpatrick told RENX in an email. IKEA has also opened six pick-up-and-order point locations in southern Ontario and Quebec, launched 10 collection points in Atlantic Canada and Saskatchewan and introduced a “click and collect” service in its stores, she said. 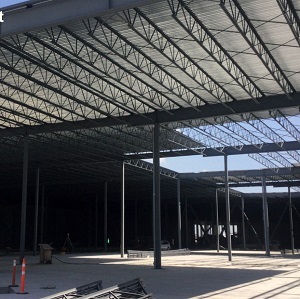 The new $40-million centre is under construction at 7031 York Road in Richmond. It’s part of a large logistics park on the north shore of the Fraser River. The property is owned by Pure Industrial Real Estate Trust (PIRET) (AAR.UN-T) and was being constructed on a speculative basis. This project is the fourth and final phase of the East Richmond Business Park, said PIRET spokeswoman Sylvia Slaughter. She said PIRET also owns the other three phases of the project, including Phase 1 at 16133 Blundell Road, Phase 2 at 16131 Blundell Road and Phase 3 at 16111 Blundell Road, which was purchased in 2013 directly from the developer. IKEA will be taking the entire Phase 4 building, Slaughter said. The lease is on a seven-year term. The building will have 70 loading docks and a building height of 11 metres, Fitzpatrick said. IKEA plans to open the building in spring 2018 and will hire about 100 new staff to operate the centre, which will pick and ship orders for its four existing stores in B.C. and Alberta, Fitzpatrick said. PIRET also owns two other IKEA distribution centres, both in the Houston area. With this new deal in Richmond, PIRET says IKEA will become the second-largest tenant in its portfolio, representing approximately 5.3 per cent of its total revenue. In June, IKEA Canada’s new president Marsha Smith told the Globe and Mail that the brand was trying to find the right balance between its bricks-and-mortar footprint and e-store. The company’s e-commerce website catalogue has grown to more than 8,000 items, the Globe reported. That’s about 1,000 items fewer than its stores currently stock. “Store visitation increased by five per cent to more than 28 million visitors, while online visitation, which includes both our Ikea web and mobile platforms, reached 88 million visitors in fiscal year 2016,” Fitzpatrick said. She said the total sales for IKEA Canada’s 2016 fiscal year totalled $2.05 billion, an increase of 14.2 per cent, year-over-year. Colliers International is the listing agency for the development. IKEA has 343 stores in more than 28 countries worldwide, and reports that 783 million customers visit its stores each year. PIRET owns nine other properties in B.C., according to its online portfolio. It is also in the process of purchasing another warehouse property in the Scarborough sector of Toronto for $16.1 million. That site currently contains a 150,000-square-foot warehouse, but PIRET plans to spend an additional $35 million to redevelop it into a state-of-the-art 300,000-square-foot distribution centre. This project will also be built on a speculative basis.